171 mm, 194mm, inside diameters. If you want to see if yours will fit, draw a circle on a piece of paper, cut it out. If your camera will go thru', then we can make a housing. If it won't then we can fabricate a housing from machined & welded aluminium plate. The 124mm dia. is an injection moulded tube & is the lightest, approx. weight including camera 6 lbs [3 kgs ]. [ Usually coloured yellow. ] All other sizes can be painted to suit customers preferance. 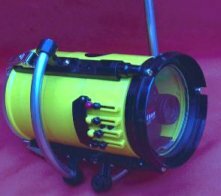 All models are basically the same & comprise; a clear acrylic front & rear lens; hand & video lamp arms; double '0' ring sealing; lockable quick release cam clamps. The camcorder is located on a plate, thru' the tripod socket, & is fitted into slots on the front & rear lens. Entry is from the rear. You can view thru' the camcorders rear eyepiece, if you want the side screen open, we can fit it into a larger tube. BUT the weight, buoyancy, & cost will increase. The basic control system is via the LANC, [ or remote control ] socket on the camcorder. We have designed an electronic board which plugs into the camcorder, & access's the Record / Standby; Zoom both directions; Re-start when camcorder switches off. The board is fitted with reed switches on the inside of the housing & magnets on the outside. NOTE, no through drilling of the housing. We only produce a flat front port, if you want to widen the view, you can fit a wide angle lens to the camcorder, & we make the housing a little longer to accommodate it. All the camcorders seem to work on the fuzzy logic system of focus, so no problem with underwater focusing. Depth limitation starts at 45m or 55m, greater depths to special order. Depending on the size of the housing, balance weights may be needed. Colour Correction Filters are also available. A blue water filter for natural light filming is also available. Filter is coloured red and reduces the blue haze you get underwater, filter fits on the outside of housing and is removeable underwater.